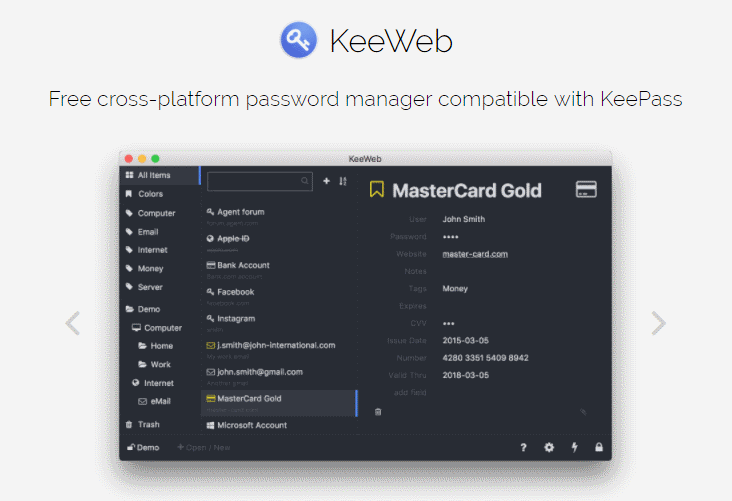 Keeweb is an awesome hybrid desktop application to manager your passwords and is even compatible with KeePass databases. It doesn't require any server or additional resources. The app can run either in browser, or as a desktop app in Windows, Mac OS and Ubuntu/Linux. The application offers an online Web version that you can try here. It has almost all features available in desktop apps. It doesn't require any installation and works in all modern browsers. You can open your Keeweb/Keepass databases from Dropbox, and sync changes across devices automatically. The Desktop application can update itself automatically. There are several options: update and install, show a notification or disable update at all. Multiple themes available. You can switch between dark and light theme, whichever you like more. The app is completely free: no trials, no demo versions, no limits, just download the latest version from the releases page of the Github repository or from the official website and install it. There's no catch, however it is not free to develop as not everybody maintains open source project. It takes time, requires paid code signing certificates and domains. You can make a donation through PayPal if you want. Even more: you can always build it from sources yourself and add features that you may need if you have web development knowledge. The source code is available on GitHub.